Sample a selection of our show stopping invitations for REFUNDABLE $2 each! Why order samples of our invites? 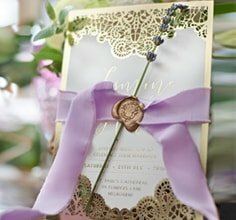 By ordering samples, you'll have an opportunity to inspect each sample thoroughly to ensure you are 100% confident in the quality of our invitations before committing to an order. Feeling the texture of our paper and viewing the layout of each of our designs in person will help narrow your scope and make the selection process easier. Your samples will then be dispatched within 24 hours of you placing your order. Ordering samples is easy – and what’s best, the cost is fully refundable upon placing your order. Select your favourite designs, and click 'order sample'. You may order any number of samples; however only the first 5 samples will be credited to you when you place an order with us. All Samples are available for $2.00 each. In the sample cart, click on submit sample order once you have chosen your top favourite designs. How soon will I get my samples? We will dispatch your samples within 1 working day after receiving your order. Shipping timeframe depends on your location, but if you’re in a rush, you may opt in for express post shipping. You will get an email form us when we have shipped your samples out. How can I redeem the cost of the samples? We will email you a credit code to the maximum value of 5 samples. This credit code will not expire, so you will not have a time limit within which to make a purchase and refund the cost of samples. This credit coupon code will also be saved under ‘My Discount Coupons’ in your account. What will be included in the sample pack?